Were you a Mr. Rogers fan? I remember when our girls were small, they'd often watch Mr. Rogers after watching Sesame Street. 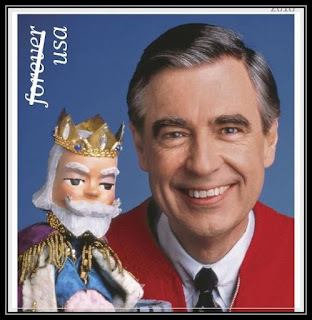 I don't know if it was the contrast between the upbeat and colorful Sesame Street with the calm and laid back demeanor of Fred Rogers, but Mr. Rogers might have had a fairly high snooze factor for adults. Not all adults, but some. While I saw my fair share of his show I didn't really get to know the man behind the cardigan until recently when we watched his documentary, "Won't You Be My Neighbor", a theater released bio-doc. It featured his wife, and two sons, some of the cast of neighbors, as well as the producers and such. We were mesmerized and inspired, and sad. We were sad because a legend, a mentor, a truly good and genuine man is gone. 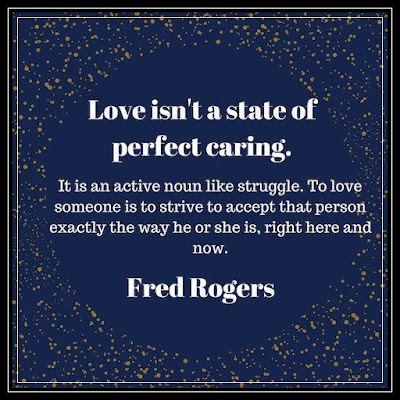 If you haven't seen the movie, I won't spoil it but Mr. Rogers was full of wisdom and advice, advice we adults could learn from, not just about interacting with kids, but about taking care of each other. I think the world could use a little of that today, don't you? 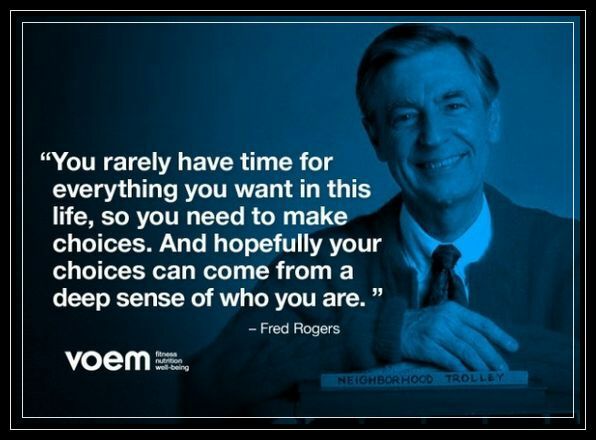 Much of Mr. Roger's neighborhood was born from Fred's own life experience. Fred had vivid recollections of his childhood feelings, his fears and his anxieties. Thus the birth of Daniel Kitty. Daniel Kitty was Fred Rogers. Daniel was able to articulate fears and anxieties because Fred never forgot how vulnerable it was to be a kid. He remembers he was afraid people would laugh at him when he tried new things. Fred says the greatest evil are those who would try to make you feel less than you are. I think we can all relate to childhood fears and anxieties. I wasn't a particularly confident child, or very adventurous. In fact some might say I was pretty wimpy when it came to trying new things. I and many could have used our own Daniel kitty to help express those fears. Mr. Rogers and his wife, Joanne, both came from childhoods that didn't allow them to show anger. Fred was afraid to use his words because he was afraid he'd be viewed as a 'bad boy'. I can certainly relate to that one. I grew up in a home that lived by the adage, 'children are to be seen and not heard'. That's probably why as an adult I can't stop talking, or writing to express myself. HaHa. Eye rolling was very high on the list of mortal sins and punishable offenses in my house as well. Fred eventually figured out that although he couldn't verbalize his anger, he could express it in other ways like in the way he plucked his piano keys....loudly and boldly. He even wrote a song about anger. It went something like this...."What do you do with the mad that you feel when you feel so mad you could bite." Who of you has never been that angry? 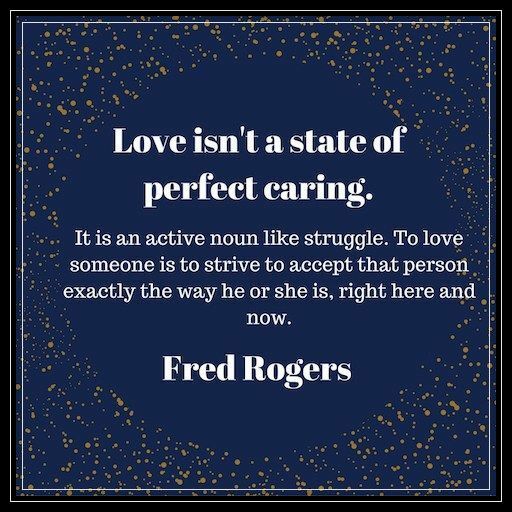 An ordained Methodist minister, Mr. Rogers felt strongly that children have deep feelings, like adults, and the feelings of a child are as real as the feelings of an adult. He said we must respond to them and the most important thing is to listen to them. Fred thought that the greatest gifts we have is to listen. Silence was his delight. That is why when Fred would ask a child a question, he didn't immediately jump right back with a response after the child's answer. He waited and given more time, the child would go on with more. Listening is definitely on the decline today with the reliance on social media and electronics for communication. In fact I wrote a post about the "Lost Art of Listening" talking about just that. (https://www.lifeasiseeitphotography.net/2015/01/the-lost-art-of-listening.html) Fred got it. He understood, and he remembered what it was like to be a kid. 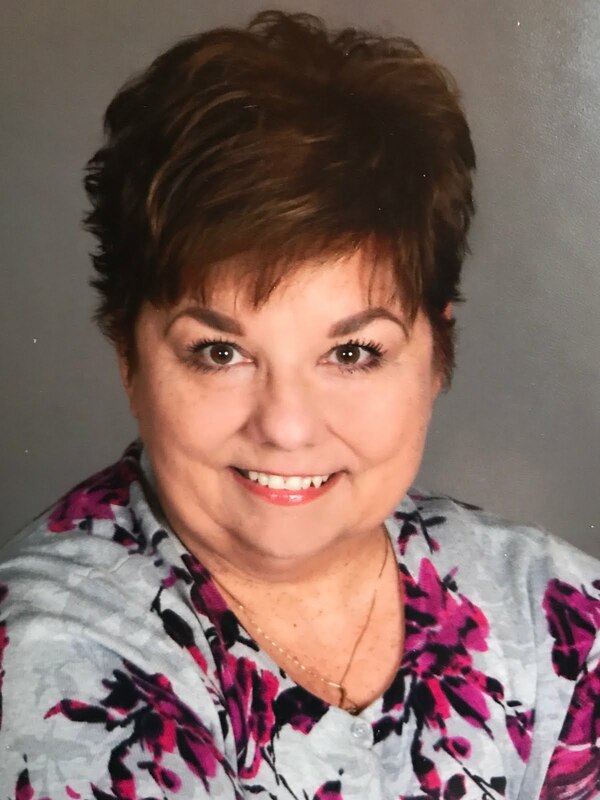 Fred recognized and emphasized that children should be taught to expect and accept mistakes and must learn how to deal with the disappointments they bring. He also understood deeper evil and wondered at times if he were a mistake. He assured kids they were NO mistake and that you don't have to do anything sensational for people to love you. If only that were always true! Fred wanted kids to know that feelings are manageable and mentionable. We adults are to be there to help children through the modulations of life. Although Fred never ministered in church, he carried out his ministries on the streets and on tv to the children whose lives he touched. He had catch phrases, mantras, reassurances that he said over and over so that children would hear, know and believe they are valued. Phrases like, "You've made my day special just by being you" and, "There's no other person in the world quite like you". "I like you just the way you are - exactly and precisely as you are". Fred said the greatest thing we can do is to help people know they are loved and are capable of loving. We are called to be the repairers of creation. In crisis, we must look for the helpers. Helpers bring forth light, hope, faith and pardon - to your neighbor and to yourself. While Fred's mission was aimed at and for children, think for a minute about his mantras. Think about his reassurances. What adult wouldn't love to feel valued, special, unique. Who among us doesn't just want to be loved just the way we are? Who doesn't long to be heard, understood and accepted? 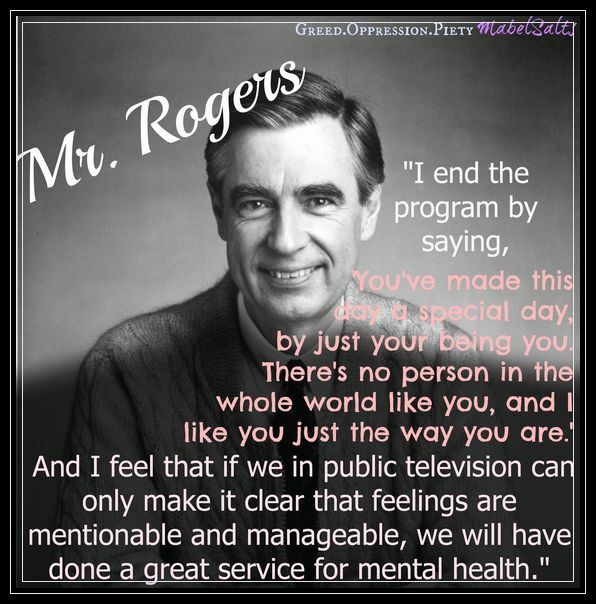 Fred Rogers understood children, and he understood mankind. He wasn't afraid to be uncool, to wear his heart on his cardigan sleeve, to expose himself for the sake of helping others. We could all stand to be a little more like Mr. Rogers. We need to slow down, to listen, to hear what our kids (and adults) say. We need to allow people to feel - whether that's pain or anger or something more positive. We need to embrace the people around us everyday - in our homes, our churches, our workplace, our community and begin to see people without judgement. We need to give people acceptance and encouragement. We need to be the helpers and sometimes those helpers aren't necessarily helping with a crisis, sometimes those helpers are just helping someone out of a bad day. So I have two challenges for you today. The first is to rent 'Won't You Be My Neighbor' from your Redbox or pay-per-view and watch it. Watch it even if you didn't like him, even if you didn't know him. 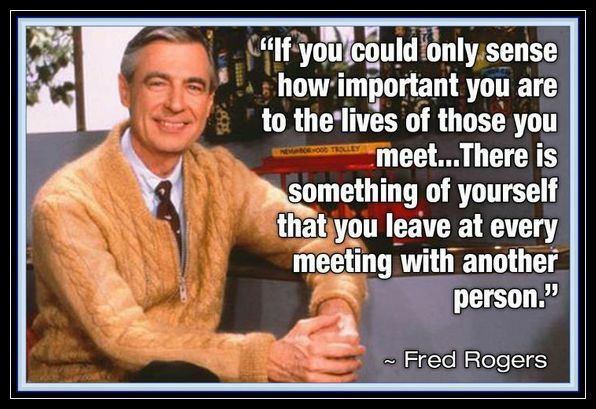 Everyone, parent or not, has so much to learn from Fred Rogers. We loved it so much, we watched it twice. And the second challenge is this.....as you go about your life this week, watch for the people who need reassurance. Watch for the people who may not remember how special they are, the people you know who walk around feeling inadequate, uncool, not enough. Find a way to share Mr. Rogers' positivity and reassurance with them. That might just mean listening to them....without interrupting. Be a helper, be that person who is so welcoming, so accepting, so loving everyone you meet will want to be your neighbor. Love is the root of all relationships - love or the lack of it. Which will you bring to the people around you this week? Fred Rogers died on February 27, 2003 of stomach cancer. He was 74.